“The X Factor” top eight acts that performed last night will learn their fate tonight. Their fate rests in the hands of America who cast their votes for their favorites. Voters are allowed to vote as many times as they like. 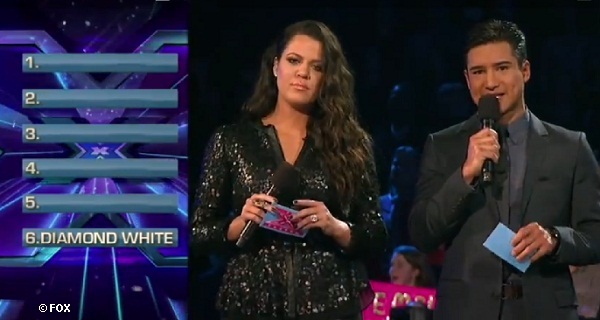 Last night, host Khloe Kardashian learned that one fan voted for Tate Stevens last week 150 times! The remaining team members were brought out onto the stage and introduced with their mentors: Britney with “Teens” Carly Rose Sonenclar, and Diamond White; LA Reid with “Over 25” Tate Stevens and Vino Alan; Demi Lovato with her only remaining contestant “Young Adult” Ce Ce Frey; and Simon Cowell with “Groups” Fifth Harmony and Emblem3. Hosts Mario Lopez and Khloe Kardashian reminded them that five acts will go straight through to be part of the top six, and the remaining two will have to sing for survival. The first two announced that were saved for America’s votes were: Fifth Harmony, and CeCe Frey. Also earning enough votes to return next week are: Emblem3, and Carly Rose Sonenclar. That left Tate Stevens, Vino Alan and Diamond White. Then it was revealed that the last act going straight through to the top six is Tate Stevens! The bottom two this week were Diamond White and Vino Alan. They both had to complete what Mario Lopez said is “one of the toughest challenges on The X Factor”. When Simon was asked what he thought he said, “If I’m being honest, I’m not surprised about Vino because I didn’t like that performance last night. But I am surprised about Diamond.” It was up to the judges to decide which act will be going home. Mario Lopez said congrats CeCe, you’re up four spots! But, wait, didn’t two people just get eliminated? Doesn’t that mean CeCe is still in the bottom two? “The X Factor” top six acts will return to perform on Monday, December 3rd on FOX!